Rita Barton, president of the Gleaners Insurance Society, and Elizabeth Moore, chairman of the leadership team of Marion’s Royal Kids Family. 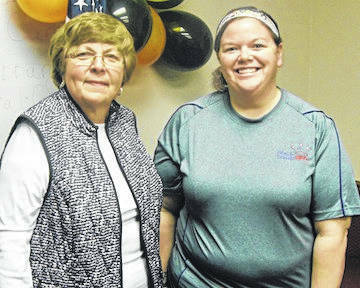 Members of Chester Arbor of the Gleaner Insurance Society met on Nov. 5 at Whetstone Industries, Mount Gilead, to hear Elizabeth Moore describe her involvement with the international program of Royal Kids Family. This camp provides for foster children ages 7-11 and is based on Jeremiah 21:11 “I know the plans I have for you.” There are 250 camps worldwide and they began in 2001 in Marion. The office can be reached at the Marion Christian Center, but there are 40 churches, agencies and organizations in this area who have volunteers that make the camp happen. There is no cost to the children attending but the cost for each is $650. Funding comes from donations and a banquet/auction held in February. This is a 501(C3) organization. Grants have been applied for to expand it for a mentoring program for these children. Plans were made for the remainder of the year for the Gleaners. Those who are interested in volunteering to support these communities are invited to attend the meetings as guests.